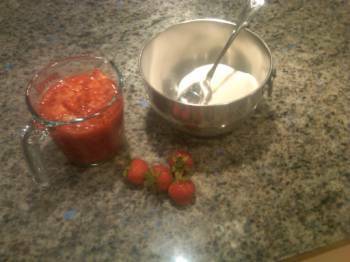 of fresh strawberry jam with smaller, misshapen berries. Bring in your strawberry harvest daily. Don't refrigerate the berries, or rinse them, as those steps will advance their ripening too fast. Rinse right before eating whole, or sneak a few from the garden immediately after picking if you can see there's no dirt on them! After the first week or so of enjoying delicious whole berries, you might want to try this easy, no-cooking recipe. It makes six 4-oz. 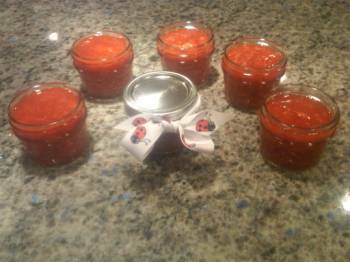 jars of strawberry jam. They keep well in the freezer for one year. Then you can enjoy the taste of fresh strawberries on your toast or waffles from your own berry patch, year-round! This recipe is easily doubled. Since it makes six 4-oz. jam jars, you might want to buy a dozen jam jars and either make this recipe twice, or double it so that all 12 jars can be filled at once. It's a good idea to run the empty jars through the dishwasher first, to make sure they are sterilized. First, rinse each berry and cut off the green top. Throw tops in the compost bin. Slice berries in half, and place in a glass pie plate. Take your potato masher, and mash, or crush, the berries. It's OK to kind of crush any lumps that remain with the side of your spoon. There will be a lot of liquid, but that's OK. Do this in a single layer in a flat dish, rather than in a deep bowl, to make the job easy without destroying the berries' natural pectin, or thickener. Crush berries by hand, instead of using a food processor, even though that sounds like the easy way to do it. But food processing is too rough for the berries. You want the natural pectin in the fruit to work with the pectin you add to set up a good batch of jam. Now, in a medium bowl, mix the sugar and the pectin with a spoon. With a spatula, add the crushed strawberries. Stir for about three minutes, to get the natural pectin working to get the berries to gel up into a jam. Then spoon the jam into the sterilized jam jars. Let sit out on the counter for a half-hour or so. Be sure to label each jar with today's date. Make a note that this jam will be fine in the refrigerator for 3 weeks, or it can be frozen and will keep well in the freezer for one year. If you're giving any jam jars as gifts, it's a great idea to tie a colorful ribbon around it.